This past week, I had the privilege of hearing Thom Zimny speak about his work as filmmaker, videographer, and film archivist for #BruceSpringsteen with @Backstreets/#Backstreets Editor/Publisher Chris Philips. Organized and hosted by the #FriendsoftheBruceSpringsteenSpecialCollection @MonmouthUniversity, the evening also served as a birthday celebration for the man affectionately known as “The Boss”. showcasing @MonmouthUniversity as a premier destination for #SpringsteenScholars, while also further substantiating and cementing the historical influence of #Springsteen’s music on education, theology, politics, culture, and society. There is also a beautiful photography exhibit in the @PollakTheatreGallery on view until September 30, with one special photo of a young #Springsteen at the piano at the 1974 concert in Harvard Square up for auction. While the guitar may be synonymous with Springsteen, he also converses with a wide range of instruments including the harmonica, organ, and piano, while also conducting his entire “orchestra” as a true #RockandRollsymphony of sorts. Taken by #RockRoyalty photographer @Barry Schneier and part of a larger collection entitled “Glory Bound”, the photo captures Bruce as the serious musician that he really is, and is one of many others of him on display alongside other musical icons including Bonnie Raitt and Van Morrison. #MonmouthUniversity is somewhat of a hidden gem of higher learning, professional development, the visual and performing arts, and college campus life to those who don’t know the #JerseyShore. If you are in the area this weekend and until September 30, definitely pay a visit to the exhibit and take a tour of the bucolic campus, which is situated less than a mile from the beach. Thom spoke about his most recent collaboration with Bruce on his first-ever short film #HunterofInvisibleGame. Hearing him walk through the film process with us and viewing it on the big screen lent it the gravitas it truly deserves, which the Internet medium just doesn’t capture. He also showed us rare footage from the vault: #NYCSerenade, #MountainofLove, #DoesthisBusStopat82ndStreet (1/2 of which Bruce wrote on a bus, the other 1/2 on the subway) from 1972, portraying a young-but-old-soul-Bruce playing to audiences of 15 people with @ViniLopez (who was in attendance) and the #BigMan #ClarenceClemons, commenting on how amazing it is to see the same expressions, gestures, and performance techniques then, as we see now. Bruce may have just turned 65, but his youthful spirit has withstood and continues to challenge the test of time. Thom and Chris closed by paying tribute to us – the devoted fans and followers who have made #EStreetNation a global #NewJersey – with the 2012 closing tour thank-you video Thom made with Bruce. The #DreamBabyDream video is an extremely poignant, moving, and inspiring piece that brought tears to my eyes and a smile to my face a mile wide. It did the same thing last night, creating a bigger smile, tears of joy, and so much gratitude for someone who has changed the world and mine, by making his guitar talk. Needless to say, we were all on our feet and left only wanting more. While we wait, we can take new delight in an ever-expanding repertoire that includes an upcoming acting debut on @StevieVanZandt’s #Lillyhammer and a picture book bringing the character #OutlawPete to life through illustrations by @FrankCaruso (who was also in attendance) accompanying his lyrics. @BruceSpringsteen.net has also just announced the release of a deluxe box set of re-mastered classics for release on November 17, just in time for Christmas. A 2015 tour is rumored to be announced soon. We could also see a new album (or two!?) in 2015. If there is any effect of aging here, it is something akin to exponential creativity and a productivity level that only seems to surge as time marches on. There is just no time for retirement when there are more stories to be told, too much music to be made, and much more life to live by doing the thing he loves the most: making that guitar talk. I waited and stood in the rain two years ago to celebrate along with 55,000+ others who belong to this worldwide fellowship now connected way beyond the original #JerseyStateline where it all started: across oceans and continents, generations, cultures, races, religions, and yes – political leanings. I listened to that concert again on #EStreetRadio driving back along #OceanAvenue with the windows wide open, breathing in the salt air, creating a new experience and perspective on that night two years ago. Needless to say, it was a #longridehome and just like waiting and standing in the rain: I would do it again in a heartbeat. September 23, 2015? 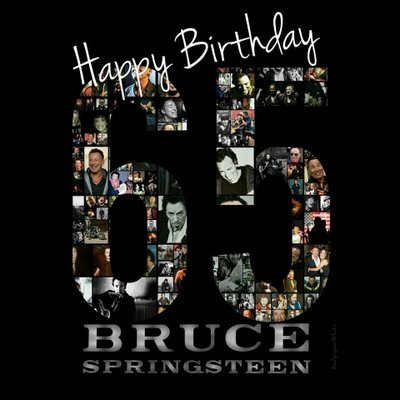 Happy Birthday #BruceSpringsteen. Here’s to fulfilling many more #dreamsbabydreams for you….and for all of us.